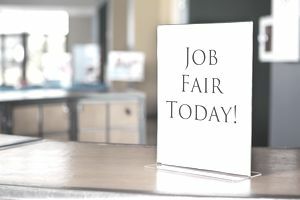 While some people find job fairs (also known as career fairs) to be stressful or overwhelming, they are in fact an excellent way to bolster your job search. A job fair is an ideal place to meet representatives of various companies at once. Today you are going to find an upcoming job fair to attend. Follow the tips below to find the best job fair for you, and to make the most out of your job fair experience. There are a variety of types of job fairs. Many are multi-employer, in-person fairs, typically held at a convenient location such as a hotel or conference center. There are also online job fairs. Often, fairs are organized by industry or by audience (such as Women for Hire, which holds online career fairs for women). There are a number of regular career fairs throughout the country. For example, National Career Fairs holds over 400 annual career fairs in cities around the U.S. When looking for the right job fair for you, check for fairs in your city or state, or consider a virtual fair. Dress professionally. You will be meeting with various recruiters and company representatives, so you need to dress appropriately. Wear a professional outfit that you would wear to an interview. However, be sure to wear comfortable shoes, because you will be standing up for a long time. Bring Your Resume. Bring several copies of your resume to give to representatives. Also bring your business cards (which you made on Day 10) to exchange with both representatives and other job seekers you meet at the fair. Keep a notepad and paper handy as well, in case you want to take notes. Prepare Your Elevator Speech. Come up with a brief, 1 - 2 sentence statement that defines your experience and skills. This will be useful when you are introducing yourself to representatives; it will briefly explain who you are and for what sorts of jobs you are an ideal fit. Consider using a form of your branding statement (which you created on Day 2) as your elevator speech. Practice Interview Questions and Answers. Each time you meet a company representative, you are participating in a mini interview. Prepare for these mini interviews by practicing your answers to common interview questions, such as questions about your career goals and relevant skills. Also come up with a few questions to ask the company representatives to demonstrate your interest in each company. Network. Job fairs are places not only to meet employers, but also other job seekers. Chat with people you meet in line or at various booths. Give out and collect business cards. Even if you do not get a job at the job fair, you will still be expanding your professional network, which could lead to a job opportunity further down the line. Keep Up Your Energy. You want to leave the recruiters with a positive impression, so remember to smile and maintain a warm, friendly tone in conversations. Even if you feel your energy is lagging (especially towards the end of the fair), try to keep a positive attitude – it will go a long way. Say Thank You. Take the time to send a brief thank you note or email to the representatives you meet at the job fair. This will solidify your interest in the company, and remind them of why you are a strong candidate.